This compact, incisive study by a senior scholar explores two sources of violent conflict in India: religion and nationalism. Showing how the political aspects of religion and the ideological character of nationalism have led inexorably to struggle, Ainslie T. Embree argues that the tension between competing visions of the just society has determined the social and political life of India. In India, as elsewhere in the world at the end of the twentieth century, religions legitimized violence as people struggled for what they regarded as their legitimate claims upon the future. 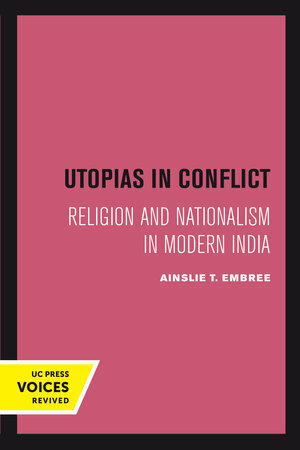 As examples of the tension between religious and nationalist visions of the good society, Embree examines two explosive cases—one involving Muslim-Hindu communal encounters, the other, the separatist movement of the Sikhs. Thought-provoking and searching, Utopias in Conflict should interest anyone concerned about fundamentalism, the problems of national integration, and politics and religion in the Third World. This title is part of UC Press's Voices Revived program, which commemorates University of California Press’s mission to seek out and cultivate the brightest minds and give them voice, reach, and impact. Drawing on a backlist dating to 1893, Voices Revived makes high-quality, peer-reviewed scholarship accessible once again using print-on-demand technology. This title was originally published in 1990. Ainslie T. Embree was Professor of History at Columbia University, general editor of the Encyclopedia of Asian History, and author of numerous books on religion, politics, and society in India.